Dam at the MDC’s Barkhamsted Reservoir. Start with a little tap water. OK, a lot of water – up to 1.8 million gallons a day. Add a dose of suspicion about a discount created by a public water provider for Niagara Bottling, the largest family-owned bottled water company in the U.S. Then a pinch of outrage over Bloomfield’s less-than-transparent approval of Niagara’s planned bottling plant. Mix in smart activists and social media. Stir thoroughly. 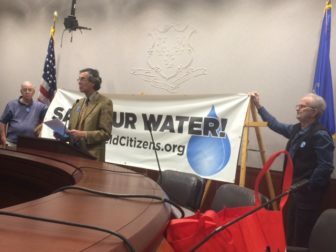 The result is high-octane fuel for a debate at the Connecticut General Assembly and the Hartford region’s water authority, the Metropolitan District Commission, about the ethics, efficacy and environmental impact of what is projected this year to become the most popular packaged beverage in the United States – the ubiquitous, single-serve, plastic bottle of water. 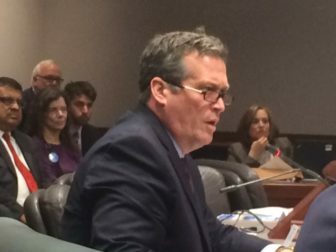 To entice Niagara – a top official of the MetroHartford Alliance says the company was negotiating with another Connecticut water company – the MDC offered its first volume discount since its founding in 1929. The break is offered to users of more than 500,000 gallons a day, at least those whose water use goes through a single meter. Controversy goes with bottled water like cookies go with milk. The plastic bottle, especially ones manufactured to hold water, whether it comes from the tap or a spring, is a vivid icon of waste. Images trumpeted by environmental groups: One day’s U.S. consumption yields enough empties that, if laid end-to-end, would stretch from San Francisco to New York City and back; One year’s worth laid end-to-end would stretch to the moon and back, 10 times. 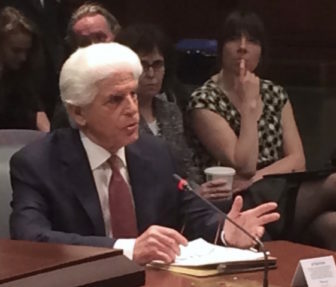 “It’s never been without controversy,” said Stan Bratskeir, a communications consultant hired by Niagara to help make its case in Connecticut. But he adds he has not seen anything quite like the grassroots opposition that quickly organized in Bloomfield, which has produced proposed legislation that would ban water and sewer discounts for water-bottling plants and empower the commissioner of public health to shut off the tap to Niagara in case of drought. “This group is particularly well-organized, particularly smart and particularly passionate,” Bratskeir said. Bradley Klein, center, and David Mann, right. They organized around a Facebook page created by a group called Bloomfield Citizens, who quickly enlisted a sympathetic Democratic state senator, Beth Bye of West Hartford, one of eight municipalities that are members of the MDC. She is an environmentalist who sometimes commutes to the Capitol on a bicycle and once tried unsuccessfully to purge the Capitol and Legislative Office Building of water coolers that rely on large jugs of water. Some of the activists are retirees like David Mann, a former Hartford planner now winding down a second career as a garden designer with his wife, Sharon. Mann says the opposition grew quickly over a sense that Bloomfield was less than forthright with the public, an impression reinforced by emails the town released to Bloomfield Citizens under a freedom of information act request. “This is now our social life, and we love it,” said Bradley Klein, a leader of the group. A third party represented Niagara during the permitting process, and it turned out Niagara was considering a site in town for two years. Mann, a member of the inland wetlands commission, said they never were told the name of the applicant when the plans came up for review. The council approved a tax abatement for Niagara on Dec. 14. According to the opponents, the existence of the proposal for a bottling plant was widely known for the first time when reported the next day by The Hartford Courant. 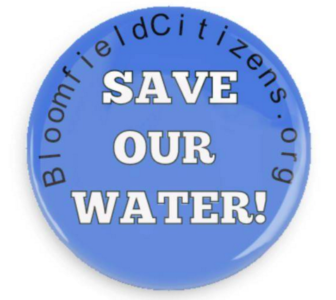 Last week, Bloomfield Citizens packed a public hearing and a press conference in support of Bye’s bill at the Legislative Office Building. They directed their ire at Bloomfield, Niagara and the MDC. “For too long, the MDC has hidden behind a wall of exclusivity and privacy, pretending that its 1929 charter absolves it of any responsibility to answer to the public,” Klein said. “Their job is to supply water. Their job is not to sell it off to the lowest big bidder. The leaders of the MDC, a regional water and sewer authority, defend the project as safe and good for ratepayers, who have seen their bills increase to pay debt service on about $2.4 billion in borrowing on projects necessary to meet clean-water standards for sewage. Conservation by industrial users, combined with low-flow toilets, showers, washing machines and dishwaters, have dropped water consumption from a high of 66 million gallons per day to slightly less than 49 million gallons. The system’s safe daily yield is 77 million gallons. Even with a discount on usage above 500,000 gallons, Niagara would pay $3.7 million annually to the MDC if it reached 1.8 million gallons a day. Scott Jellison, CEO of the MDC. Scott Jellison, the chief executive officer of the MDC, said the discount was offered to encourage Niagara to fully build out its plant. The company has proposed up to four bottling lines, each expected to use between 250,000 and 450,000 gallons daily. According to public statements the company made in December, Niagara expects to start with one or two bottling lines with initial employment of 38 that could increase to 125 with four lines. Bratskeir said the jobs would pay about $35,000 annually, assuming “a bit” of regular overtime. That would mean an hourly rate of less than $16. Jellison said a discount above a half-million gallons was seen as a threshold to encourage construction of the third and fourth bottling lines. The MDC has a history as a politically independent authority. While a public entity, its commissioners do not stand for election; they are appointed by member towns, the legislature and governor. The chairman of MDC’s board is William A. DiBella, a former Senate majority leader and Hartford councilman who was first appointed to the board in the early 1970s with the blessing of the legendary power broker, John Bailey, a state and national Democratic chairman. Bailey had his own seat on the commission, which he handed to DiBella before his death in 1975. Technically, DiBella is an appointee of the Hartford City Council. DiBella said the MDC has no right to deny water to any facility in its coverage area, so long as it can safely supply service. “We don’t have the right to go in and say, ‘Hold on’,” DiBella said. If they did have the right to deny water, DiBella said, the MDC would hold a veto over development in the region. Bye questioned if the MDC were selling too low, given what she said was the profit margin on bottled water. Based on the retail price of Niagara’s most popular product, a 16.9 ounce bottle of water, the profit margin mentioned by Bye seems wildly exaggerated. Niagara water can be purchased in 16.9-ounce bottles at Lowe’s for $3.77 a 24-pack and $4.95 a 32-pack. That is a retail price of not quite 16 cents a bottle. The MDC charges $2.66 for 100 cubic feet of water, or 748 gallons. With an 18 percent discount if it buys more than 500,000 gallons daily, Niagara would pay $2.10 for every 748 gallons, which Bratskeir says the company then would filter, subject to a reverse-ionization process and then add small amounts of minerals for taste. Opponents say the Niagara project raises questions broader than whether MDC is getting a good deal. While water is plentiful now – even in a time of mild drought, MDC is holding about a two-year supply of water in its two massive reservoirs – is water a commodity that should be sold for a profit for the relief of ratepayers? If it is a draw for business, should it be used to attract industries that pay more than $16 an hour? Mann, the former city planner, said he could understand a discounted water rate that attracted better jobs, which would spin off greater economic activity in a region suffering from slow growth. 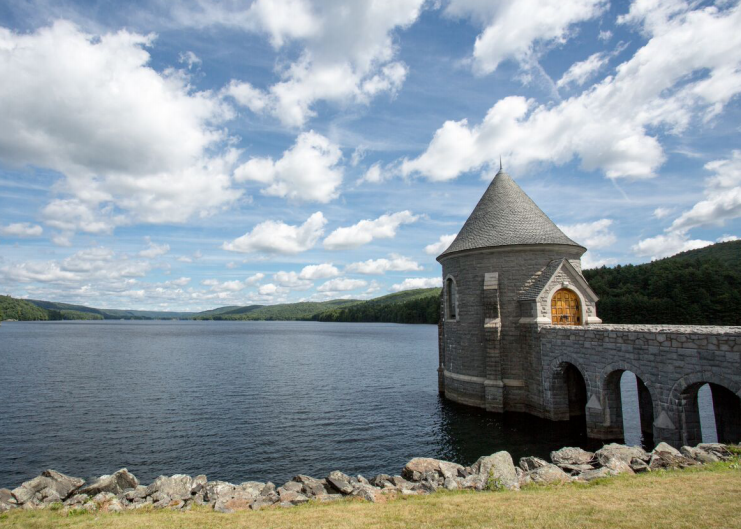 The MDC says it can handle Niagara and other major users and still safely serve the Hartford region, thanks to water works begun by the city of Hartford, which built the Nepaug reservoir in 1917, and taken over by the commission in 1929. “Water for Hartford,” a history of the Hartford Water Works and the MDC published in 2004, describes a system that produces some of the nation’s cleanest, best-tasting water in quantities capable of serving a far larger residential population and commercial base. The author Kevin Murphy mentioned bottled water with disdain. Niagara expects to be selling a lightly treated version of Hartford’s drinking water in stores in Hartford and throughout the Northeast in late 2016.